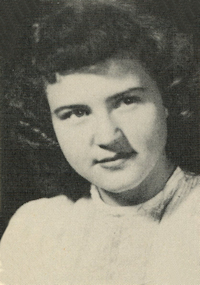 Obituary – Moore, Lenita Doreen (Hladik) « Perry High School Alumni Association, Inc.
﻿Y-Teens 47-48, Red Hots 47-50, Library Staff 49-50, Perryscope Staff 49-50, Junior Assembly 48-49. Lenita Doreen (Hladik) Moore, 84, of Andale, Kansas passed away November 8, 2016 at Via Christi Assisted Living Center in Wichita, Kansas. She was born July 13, 1932 near Stillwater, Oklahoma, to Joseph and Mary Etta (Blake) Hladik. Lenita graduated from Perry High School in Oklahoma in 1950. She then attended Oklahoma A&M (now Oklahoma State University) in Stillwater, Oklahoma and then Southwestern College in Winfield Kansas, receiving a bachelor’s degree in Education in the spring of 1956. She began her teaching career as a first grade teacher in Mt. Hope, Kansas. There she met Robert ‘Bob’ Lee Moore, whom she married on February 17, 1957. They made their home in Mt. Hope, Kansas and later in Andale, Kansas, where they raised their two sons, Martin and Mark. Lenita later taught at Garden Plain, Kansas and then finished her career teaching 4th grade for many years in Maize, Kansas school district. She was also an owner and operator of Tamac Pottery in Perry, Oklahoma for several years. After Lenita retired, she focused her passion for reading and education by being instrumental in establishing the Andale Public Library. She also served for several years on the Andale City Council and she was a member of the Andale Chamber of Commerce. Lenita enjoyed spending many days volunteering at the Dillon Nature center as well as numerous other places. Lenita was preceded in death by her parents and her husband. She is survived by son Martin Michael Moore and his wife, Jane, of Bartlesville, Oklahoma; son Mark Mitchell Moore and his wife, Cheryl, of Andale, Kansas; granddaughter Jillian Michelle Moore of Ponca City, Oklahoma; granddaughter Kelsey Nicole Moore of Kingman, Kansas; grandson Matthew Robert Moore of Fayetteville, North Carolina; grandson Mitchell Joseph Moore of Lawrence, Kansas; one sister, Mary Jo McGinnis and her husband, James, of Duncan, Oklahoma; and many nieces, nephews and cousins. Graveside services were held November 14, 2016 at 1 p.m. at Mt. Hope Cemetery. Services were under the direction of Ott Funeral Home in Haven, Kansas. In lieu of flowers, the family requests contributions to the Andale Public Library.